The Valencia is the ultimate juice orange. Its bright, beautiful, abundant juice looks great and stores beautifully. If you&apos;re an orange juice fiend, this is the one to buy! But because they&apos;re virtually seedless and have a great, full flavor, they can also be enjoyed out of hand. 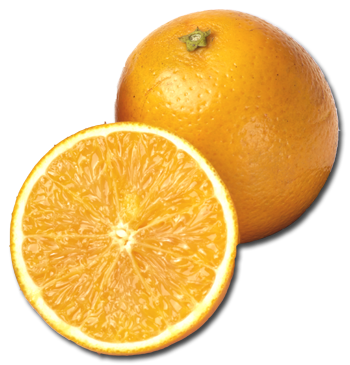 The Valencia is a medium-sized orange with a deep golden hue and a thin rind. It&apos;s a late-season orange, and because of that, it sometimes experiences a funny thing called regreening, where its rind turns a bit green again after turning orange. Don’t be put off if you see this on a Valencia Orange. It doesn&apos;t mean the interior isn&apos;t ripe — in fact, it often means the fruit is even sweeter than usual. The Valencia Orange has a full, balanced, classic sweet-tart orange taste. It&apos;s the flavor you know and love as the taste of Florida orange juice. These juicing oranges are, well, juicy! You can expect a nice yield of juice when you buy Valencias. You may find a few more seeds in a Valencia Orange than you do in a navel, but they’re still pretty seed-free...fewer than 6 per fruit. Valencias are a little harder to peel than some other varieties due to their somewhat more tightly adhered skin. As we&apos;ve mentioned, they’re very popular as a juicing fruit. However, many people also enjoy eating them out of hand. Their availability during the spring and early summer makes them a great choice for those who&apos;d like a refreshing citrus gift at warmer times of the year. Valencia Oranges are available for purchase much later in the season than most — from March through June. Over 50% of Florida&apos;s orange crop is made up of Valencias, most of which get juiced up for the world&apos;s thirsty juice market. Valencias can have two different crops of fruit on the tree at one time! We have to know what we&apos;re doing when we harvest these. Valencia, a city in California, was named after the Valencia Orange. At one time, CA grew many Valencias, but today they are primarily a Florida orange. A personified Valencia Orange was the mascot for the 1982 World Cup, played in Spain (including matches in Valencia, Spain). The history of the discovery of the Valencia is a bit uncertain. Some say the Valencia was first grown in Portugal (perhaps in the Azores Islands), then brought to Spain, where it was named after the Spanish city of Valencia. However, other sources claim that it was first hybridized by William Wolfskill, a land developer and grower working in California in the 1860s, who then named his creation for the famous orange-growing Spanish city.